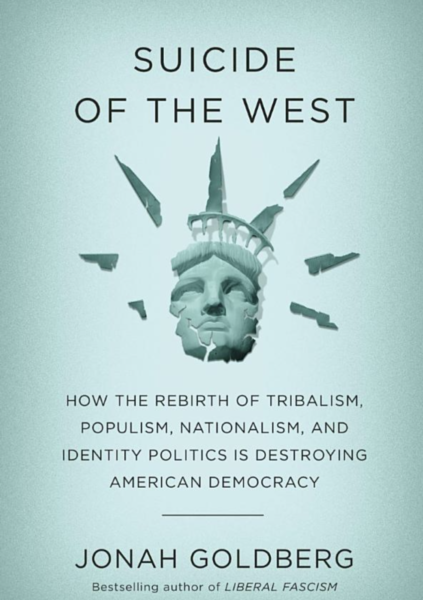 This week, it’s our good pal Jonah Goldberg for the full hour to talk about his new book, Suicide of the West: How the Rebirth of Tribalism, Populism, Nationalism, and Identity Politics is Destroying American Democracy (yes, you MUST buy it!). We delve into the book’s argument, the lineage of the title, and what can be done in terms of suicide prevention. It’s a fantastic conversation. Also, Rob’s in Paris and will there be peace in our time on the Korean Peninsula? Mon dieu! Mack Weldon’s mission is simple: to make sure all your basics (and beyond) are smartly designed and shopping for them is easy and convenient. For 20% off your first order, visit mackweldon.com and enter promo code RICOCHET at checkout. Da-amn! Excellent job Jonah. I have my copy of the book and am looking forward to getting into it. This was excellent. I was fearing we’d here the same thing as on the 20 other venues that Jonah has already used to promote his book, but both the interviewers and interviewee are clearly smarter than that. Also, nice choice of closing music. Huh. I’ve heard Jonah interviewed a couple of times; there’s nothing he’s said that has inspired me to read his book. No “ah hah!” moments. Nothing I didn’t know or heard before. My guess is that the people who should read his book won’t. The closing music ruined my afternoon.I watched MASH live; my kids watched it on DVD. And they’re all grown. Surely I’m not this old ??? Yes, loved the outro. Brought back memories. I’m reading the book now and it is excellent. Much of it may have been said before but it bears repeating and Jonah brings it all together in a refreshing and illustrative way. People often don’t realize what they have until it is gone. I also loved the exit music. I loved that song. I still sing it all the time when I get fed up at work. It depends on what your priorities are, that’s all. I’ve been emailing people at aei and Ricochet about AFFORDABLE accommodation near the conpodcon get together. No one is replying. Anyone have any good ideas? Depends on what you mean by affordable. There seems to be a Holiday Inn right nearby. If you are familiar with and comfortable with the Metro, it could expand your options, perhaps. I used to stay out in a Holiday Inn that may have been in Reston, but it was only a couple of blocks from a Metro station. Getting out from the center of DC tends to bring the prices down. I would not stay at any of the real “economy” hotels. I tried it once in the DC area. It was disgusting, and then I tried to take a shower and the spout of the faucet shot off the wall and hit me in the foot, and there was simply no way to get it to thread back on or hold long enough for a shower. They were also a shuttle drive away from the Metro, rather than easy walking distance, and it was somehow in the backwoods of the Virginia swamps where the only food in walking distance was the hotel restaurant. Very bad experience. I live in the area and wish I could attend but I have difficulty in walking very far and I fear it will be too difficult. I was wondering if there was easily accessible Disabled Parking nearby as I have a VA placard. I second the idea of staying somewhere in northern VA close to a Metro stop, although Metro is not very pleasant either. I am in Prince William County and there is plenty of good accommodation for a reasonable price. You could take the VRE into Union Station too. My current plan is to do this northwest of DC so I can get a head start driving back towards Chicago Friday night. Give AEI a call tomorrow at +1 (202) 862-5800 and ask about their Disabled Parking. I’m sure they have some. If you have any problems getting an answer, PM me and I’ll ask. As for affordable hotels, I’m afraid we won’t be of much help I’m sorry to say. AEI is a two block walk from the Dupont Circle Metro stop, so it is easy accessible from other parts of the city and the suburbs. The price of your ticket does include a lunch and two dinners (and two cocktail parties! ), so you’ll save some money there. We will also be hosting a Ricochet meet-up (not at AEI but nearby) on the evening of Thursday May 10th that all conference attendees will be admitted to for free. We will be formally announcing that event tomorrow (Hint: people who like a certain recently fired Mad Dog and a certain English Man will be quite pleased). I like Mr. Goldberg’s “Hypocrisy illuminates an ideal,” or more completely “… illuminates a violated ideal.” For this observation alone, it was worth listening to the podcast. It was surprising to hear Mr. Goldberg defend the blank slate. Oh, sure, he paid lip service to human nature, yet went on to assert that humans are completely fungible: a Viking offspring will become an orthodontist in Westchester County if only brought forward in time and installed in a New Rochelle home. It’s almost as if genetics and natural selection affect every part of every living thing except the human brain. Mr. Goldberg’s understanding flies in the face of the evidence. I was put in mind of that this morning upon reading this article: What Happens When We Randomly Assign Children to Families?, from which I copied the following figure. 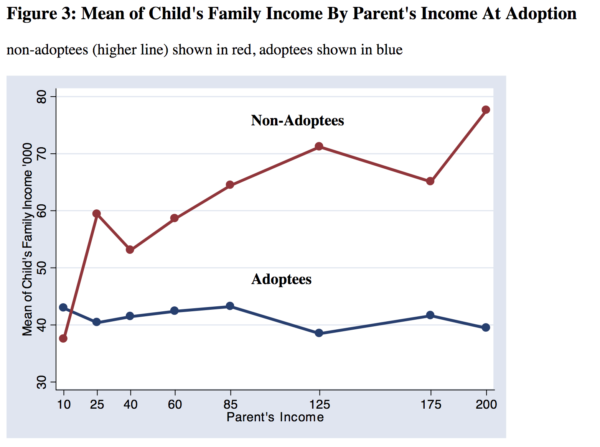 It shows the relationship between parental and offspring income for natural children and adoptees. Clearly, heredity plays a significant, perhaps dominant, role in this case,* as it does in so many other aspects of human behavior and personality. Human subgroups have varying attributes. Natural selection works on H. sapiens too. *The data also show regression to the mean among non-adoptees but that’s a whole different topic. It shows the relationship between parental and offspring income for natural children and adoptees. It’s irrelevant what you think it means or does not mean The paper uses non-adoptees. Are you unclear on what that means? The paper also uses biological children interchangeably. Presumably, you would have the same issues with that. All children are biological, amirite? If it makes you more comfortable, substitute non-adoptees in my comment. Did you have anything interesting to say about the substance? The paper also uses biological children interchangeably. Presumably, you would have the same issues with that. All children are biological, amirite? Biological children would be better and perfectly fine by me, as would non-adoptees. But “natural children” is a polite term for children who rode to their parents’ wedding on a bicycle, if there was a wedding to ride to. Did you have anything interesting to say about the substance? Nor am I here to meet yours, especially your semantic expectations. But I gave you an alternative to mitigate the microaggression. Who knew anyone would be so sensitive here? a Viking offspring will become an orthodontist in Westchester County if only brought forward in time and installed in a New Rochelle home. Uh, I didn’t take up orthodontics. Just sayin’. Grass-fed is for hipsters and tree huggers. Grain-fed is always best. Grass fed is better for your health. It’s easier on the environment. More likely to have E. coli contamination. Even if they just finish the last couple of weeks on grass, it changes their chemical balance enough to eliminate the E. coli. I don’t know what to say, the Cornell study that implied this only studied 3 cows and didn’t test for E. Coli. It only tested acidity. There are tons of data points that show the prevalence of E. Coli in dairy cattle (grass fed) is just as high as in feedlot cattle. Add that to the fact that contaminating E. Coli is thought to come from the hoof or hide and not the intestines. It heavily depends on the forage fed as well. Often barley or grass pellets are used, which show no sign of reducing acidity over corn. Grass fed is better for your health. Marginally. Beef is good because it has fat in it. Grass fed has 16 more milligrams of omega-3s per 100 grams than corn fed. For reference, a 100 gram piece of salmon has 2,342 milligrams of omega-3s. Omega-6 is similar with numbers of 428 to 596, while an identical size piece of chicken has 3091. 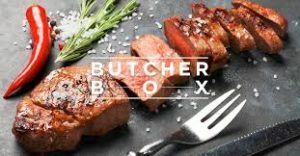 If you are eating beef to be healthy just have a piece of chicken or salmon once every month instead. It’s easier on the environment. Not necessarily, grass feeding is incredibly land intensive. You’d have to dismantle the ethanol industry if you wanted to actually see which is easier on the environment. As it stands, field corn is used once to make ethanol and then a portion is used again as feed for cattle. If ethanol were no longer mandated then we could argue about optimal land use, but since the land is already being used for ethanol might as well use it twice for feed. (sigh) Grain. Fed. Tastes. Better! Barley finished best of all. Alrighty. I sit corrected. I read an article about it many years ago, and just remembered what I had read.